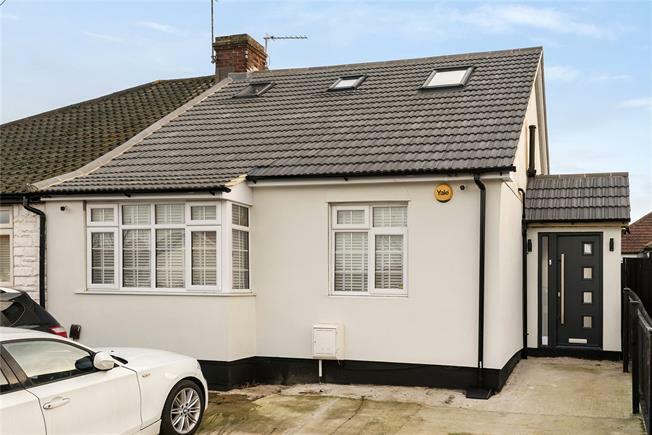 3 Bedroom Semi Detached House For Sale in Orpington for Offers in the region of £425,000. This three bed semi-detached property has accommodation over two floors having been extended into the roof since its original construction as a bungalow. Thoroughly modernised throughout and with the addition of an entrance hall to the side, the property includes a reception room on the ground floor that is open plan to a fitted kitchen, along with a shower room and two of the bedrooms. Stairs to first floor lead to the master bedroom which has its own en suite bathroom and dressing room. Outside, you will find a driveway at the front that provides off-street parking for three vehicles whilst to the rear, there is a private garden landscaped for ease of maintenance with artificial lawn. Situated just a third of a mile from Orpington, a thriving suburban town centre within the M25 and therefore ideally situated for access to the motorway network and the railway stations that can transport you into London in as little as 17 minutes. The town centre has a comprehensive range of shops and facilities including the Walnuts Shopping Centre and Odeon cinema. Sports facilities are also well catered for with the Walnuts Leisure Centre, golf courses, football and rugby clubs all within the area. A little way out of town you will find larger stores at the Nugent Retail Park along with electrical superstores, furniture shops and DIY centres along the Sevenoaks Way. Larger shopping centres at Bluewater and Bromley can also be found within 10 miles drive or bus ride. A recently renovated, extended and well presented three bedroom family home with accommodation over two floors. Double glazed front door, fully tiled flooring, double glazed door providing access to the rear garden. Underfloor heating, wood effect flooring. Double-glazed window to side, a large walk-in shower, a low level WC, a wash hand basin, a heated towel rail, the fully tiled walls, and wood-effect tiled flooring (with underfloor heating). A double glazed window to rear, stairs to the first floor landing, alongside wood effect flooring (with underfloor heating). The kitchen is of a smart and efficient design and utilises space intelligently. Benefiting from a range of matching wall and base units (with worktops over), a breakfast bar, a sink and drainer unit (with mixer tap), alongside integrated appliances to include; a dishwasher, washing machine, electric 'Hotpoint' double oven and grill, and matching microwave. The part tiled walls and wood effect tiled flooring provide the finishing touches, whilst a double glazed door to rear allows for easy garden access. (Located on the ground-floor) A double glazed window to front, wall mounted radiator, fitted carpet. Double-glazed window to front, a wall mounted radiator, fitted carpet. The first floor landing comprises a fitted carpet, and a double glazed window to rear. (Located on the first floor) The master bedroom is of impressive proportions and benefits from a large double-glazed window to rear, a wall-mounted radiator and fitted carpet. Access to the adjoining en suite and walk-in dressing room. Incorporating a low level WC, wash hand basin, a heated towel rail, as well as a feature free standing bath. Fully tiled walls and flooring. Open plan to the en suite bathroom, with eaves storage, and a fitted carpet. A decked area from the kitchen the remainder laid with artificial grass. The driveway to front provides ample off-street parking for 3 cars.